You might say this is like trying to compare apples and oranges, and I think you might be right, not because one's better than the other, bottom line spoiler, but because they're different in tone and overall story design, but also even in scope. What I'm trying to analyze is how King Kong changed since 2005, why these changes are made and if they makes sense for the future of this classic monster movie. I'm not about to go into the history of King Kong movies, but it's fair to say that most people regard the original 1933 movie as the best one until this day. I don't know if it's nostalgia or if the movie is regarded today as a cinematic marvel for its time, but the originals are usually considered more important to cinema history than any remake or reboot, no matter how technically superior. But since I'm not going to go that far in time, all I want is to see if Peter Jackson's remake is the definitive King Kong of a new millennium, or if Legendary Entertainment's new attempt at reviving the titan ape in the hands of a relatively unknown director was a good idea. While we all know Peter Jackson all the way back from his 1992 shocking horror movie Braindead (or Dead Alive), but most notably for his amazing Lord of the Rings trillogy, Jordan Vogt-Roberts hasn't really directed anything noteworthy, unless you're into hipster dramas, either for television or indie festivals. Fortunately, Vogt-Roberts was backed by two amazing screenwriters, Max Borenstein of 2014's Godzilla, and Dan Gilroy who both wrote and directed one of my favorite 2014 movies, Nightcrawler. Peter Jackson wanted to recreate the first King Kong movie, which will always remain a historical landmark in cinematic visual effects, but also creating a new form of horror, the giant monster movie. Largely, Peter Jackson took that story and adapted it to a new and more demanding public. The original will still be there, but the remake is something different and expands upon the original's mainframe. The horror is no longer in the giant and savage simian destroying human civilization after human invaded its habitat, although the story follows the same principle, but more of an analysis of the morality behind it. 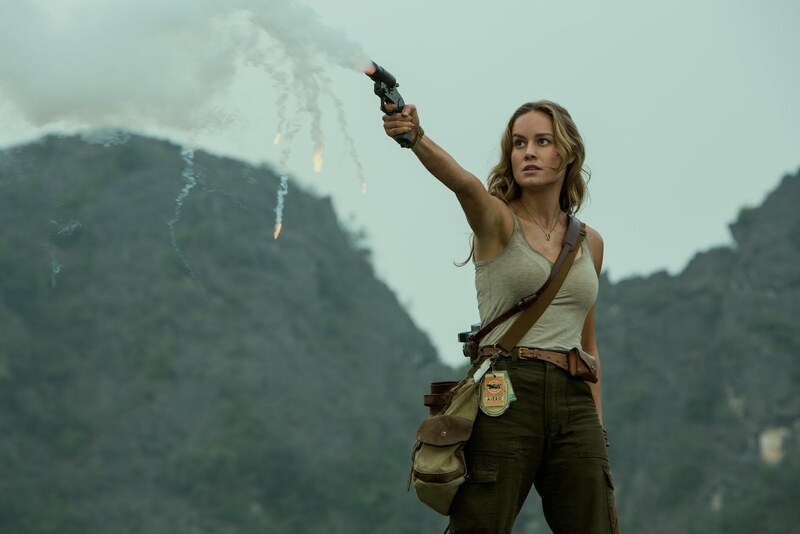 Kong: Skull Island is beyond all the epic melodrama. Vogt-Roberts wants to make a comment on war, specifically the Vietnam war, one that was in so many ways a terrible spot in human history. The movie doesn't shy away from it, it's very obvious from the very start. It is only when a force bigger than two fighting sides when the war must stop. Crazy as it might seem, the movie was really shot in Vietnam. I don't know why it might seem crazy, we're not in the 70's anymore, but it's still profound to see a movie taking place around the time US troops retreated from this country. Yes, it's not only a metaphor. Right after the opening, US army drops bombs on a jungle like they make it rain... fire! The allegory goes far from just dropping bombs from Hueys. A smug colonel thinks he can take on this savage force in its own home and destroy it, but it's much more difficult than it seems. It goes so far as to give Kong a PTSD in the end scene. 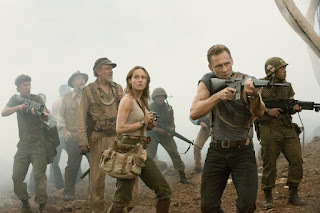 Unlike Peter Jackson's King Kong, this Kong, King of Skull Island doesn't let himself awaited. Nope, you think you're gonna watch 40 minutes of people talking about stuff you don't care about, but not even 5 minutes in the movie and suddenly Kong pops up like "hey... watcha doin?" If I were to compare the special effects, I would say the 2005 movie actually stands very well the test of time. I was surprised to see Kong: Skull Island still struggling with green screens and obvious CGI, although maybe a bit more detailed models. 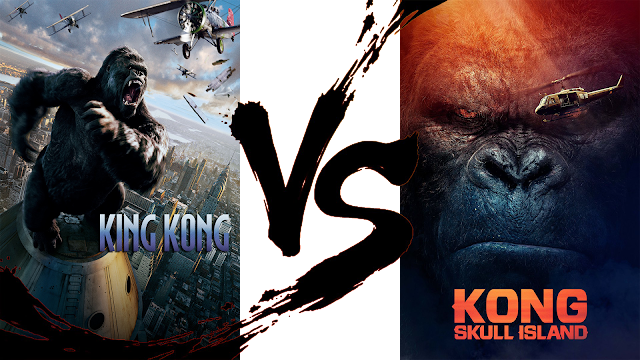 But if you can just watch the 2005 King Kong and then 2017 Kong: Skull Island I think you'll be impressed too. What you will notice is how drab the color palette used to be back in the early 2000's, that greyish tint that was popularly used to mask and more easily blend CGI with live sets and actors. Since then, digital special effects have evolved so much there's no need for a specific tone and fortunately Kong: Skull Island looks colorful and vivid. The cinematography is fantastic. Almost every scene can be an awesome poster to hang on your nerd wall. 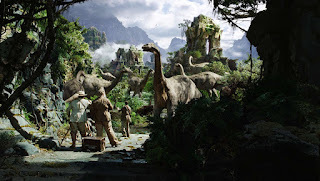 In 2005, Skull Island was a forgotten land where dinosaurs didn't go extinct for some reason and shared the island with all kinds of weird creatures, but also a tribe of humans that learned to keep themselves safe from the dangers of the jungle. 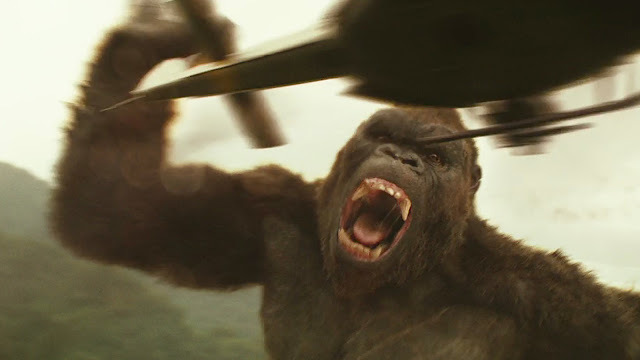 Also, Kong wasn't really king there, he was a beast that was more agile and more powerful than all other. As we all know, we're shown this when Kong fights two T-rex at the same time. But he's ultimately just another creature living there. 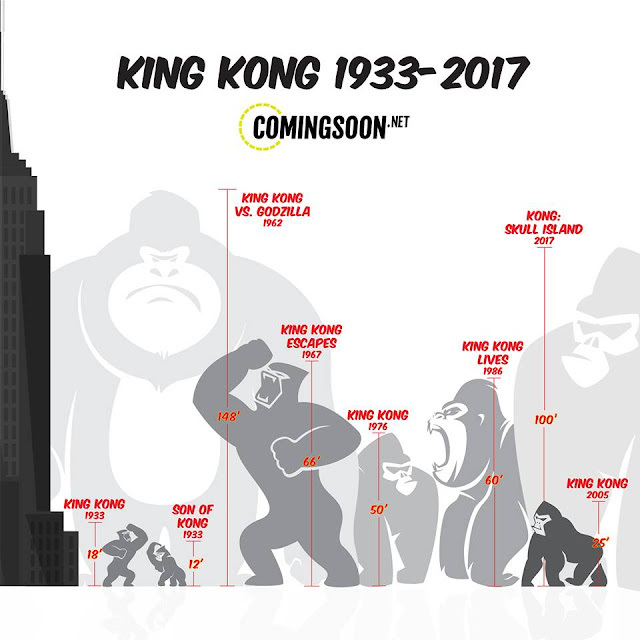 In 2017, Kong is definitely the king. The only creatures that fight him are a bunch of two legged lizards that live in underground caves, an obvious homage to the classic, and the humans. 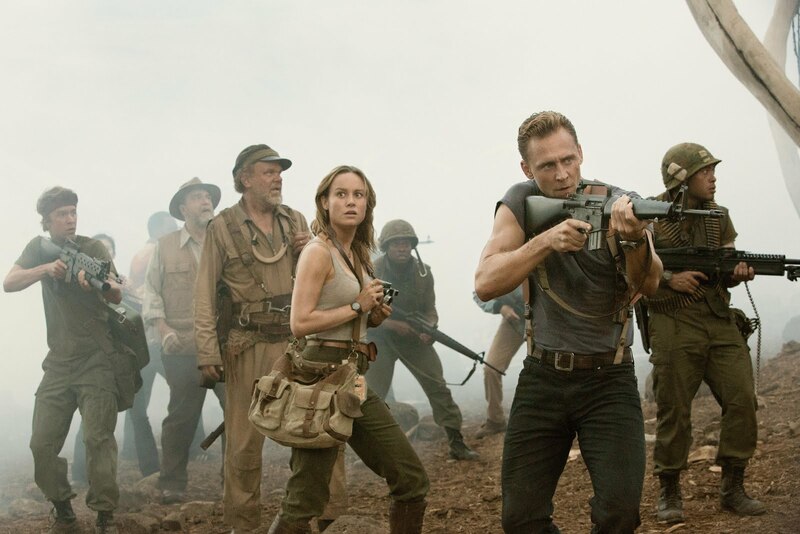 While there are no real "villains" in the common sense of the word, and the threat to both Kong's island and the characters who are trying to escape it is a terrifying force in its own right, the movie still tries to shove a human antagonism in the play. 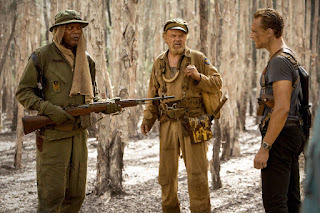 Lieutenant Colonel Packard, played by Samuel L. Jackson, and the scientist who brings them all to this forsaken place, played by John Goodman, are really passionate about killing Kong, specifically. They both have their reasons, but I think they were poorly handled and completely irrational given the circumstances. Surprisingly, Packard comes very close to succeeding, which isn't a spoiler since it's obvious that the real threat they'd be left with couldn't be handled by a handful of people with guns. Why it didn't make much sense to me was because prior in the movie, these characters don't give any reason to be doubted. Packard doesn't make a big deal about the US retreating from Vietnam and we're never shown that he seeks validation of his heroics, that he can indeed take an enemy, that he doesn't want to back down. I want to believe that at one point in the script it was written, but it's nowhere in the movie. Bill Randa, John Goodman's character, is shown as a very passionate scientist who makes valid points, until he derails into a revenge fantasy he felt that he had to take on. Peter Jackson's characters were all out of their element, a crew of misfit filmmakers accompanied by hired guns. I never could take Jack Black's character seriously and neither Adrien Brody as a survivalist action guy, since he played a cowardly writer. But in Kong: Skull Island, every time someone does something odd and uncharacteristic, it's very noticeable. 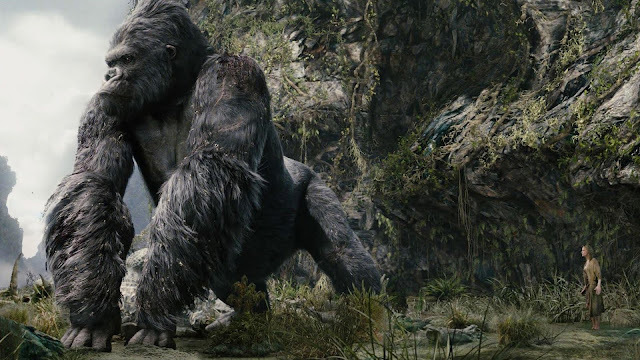 As you may already know, King Kong was formerly motion captured on talented actor Andy Serkis, who's done impressive work on Gollum in Peter Jackson's Lord of the Rings and The Hobbit, and, most recently, played clever ape Caesar in the Planet of the Apes reboots. 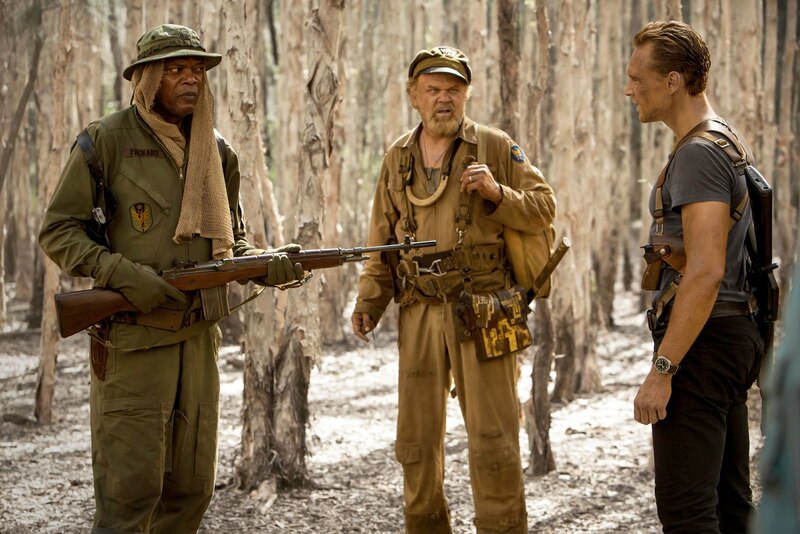 In Kong: Skull Island, the titular giant is mo-capped using Terry Notary, who has also worked on the Planet of the Apes reboots and The Hobbit, but also on the Warcraft movie, among many other. His talent shows. 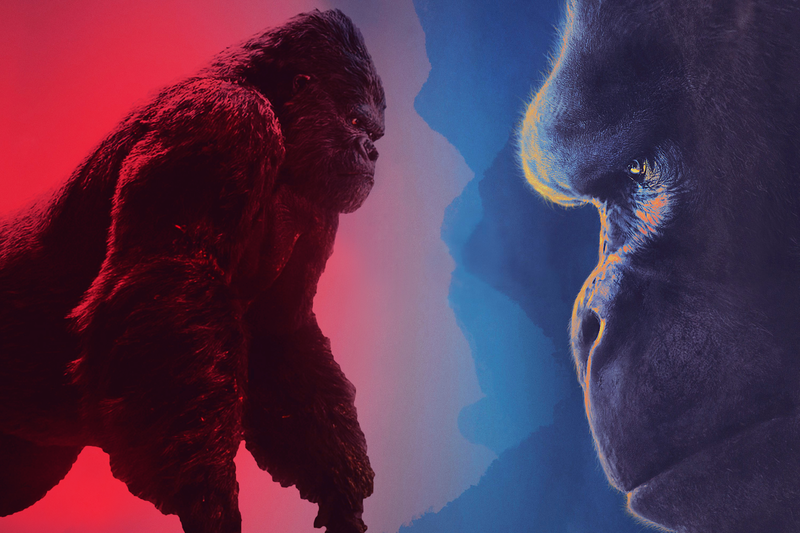 Kong doesn't show as much emotion as Serkis' version, but the movie isn't as drama focused either. They both deliver different versions indeed, only Serkis plays a more natural gorilla and Notary a bigger, more terrifying monster. One other thing that was changed was the indigenous tribe on the Island. They live among monsters and strive only to survive. While in King Kong they're just as savage as the beasts and attack the main characters to sacrifice them to a reluctant "God", in Kong: Skull Island, the tribe lives in peaceful bliss under Kong's protection and only fear the beasts that live underground. So, while Peter Jackson's version is in this case much closer to the source material, Vogt-Roberts goes for a more interesting approach. The idea is that our main characters have enough to deal with without fighting their human peers, but neither movie follows this premise to the end. In one case, sure, they have to fight both the tribe and the beasts, while in the other case, they forget their priorities and start fighting each other. The music was notably good in both movies. Peter Jackson made sure to accentuate his dramatic vision with a full orchestral theme, while Roberts opted for his war influenced monster movie to have a modern cinematic with all the bass drops and synth waves, intertwined with popular songs during the Vietnam war, like Jefferson Airplane's cult song White Rabbit, to accompany and better emphasize the satirical scenes. Peter Jackson's Kong is slightly taller than the original King Kong from 1933, however they changed the physiognomy from an upright guy in a rubber costume to a more "realistic" depiction of a 7 and a half meters gorilla. In Kong: Skull Island, the King is about 100 feet (or 30 something meters) tall. To put a perspective on the height of these huge beasts, Legendary's own Godzilla is a whopping 354 feet (or 108 meters) tall. 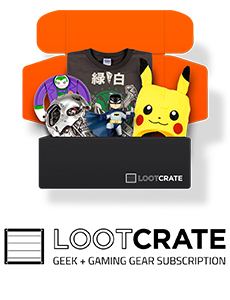 In other words, if we'd be like tiny rats to Kong, in relation to Godzilla we'd look like squishy cockroaches. They went back to the classic upright monster design, but they kept some realistic aesthetics of a gorilla. Kong looks now like a very buff sasquatch, which is a welcoming change for the type of monster movie they wanted to make. So, given that a Godzilla vs Kong movie is already in production, how can they possibly pair a fairly huge beast like Kong against a titanic Godzilla that has atomic breath? There's a scene in the movie which hints at Kong being very young and still growing, but I still don't see Kong reaching Godzilla's size. So the only explanation is a David vs Goliath battle in which Kong fights against the titan lizard with sheer wits and agility. And then they'll most likely team up against a bigger threat. That's my bet. In conclusion, I can't objectively say which movie is the better one, since they're completely different beasts with obviously different visions and, also, different in scope. Both are pretentious pieces, but one's a tearjerker and the other is a satire of sorts. I love both movies for completely different reasons and the same goes for what I dislike about them. If there's a lesson to take from this is that we can't expect a giant monster movie to be Oscar material and to just respect these movies for what they are. Therefore I'm really excited to go overboard with my hype for whatever they do with King Kong in the future.